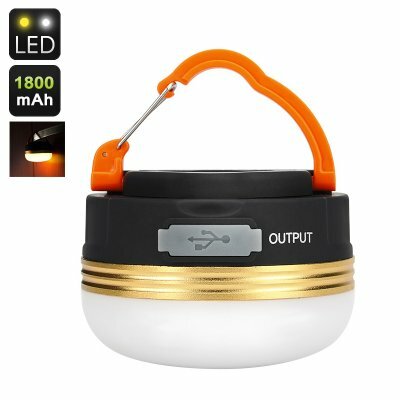 Successfully Added 180 Lumen Camping Light - IPx6 Rating, 1800mAh Battery, Phone Charging Function, 3Light Modes, Hanging Clip, Built in Magnet to your Shopping Cart. IPx6 Waterproof rating and tough ABS plastic body this durable LED lamp is your perfect camping companion. 3 lighting modes offer options for all you outdoor and camping needs. This LED camping light is your perfect outdoor companion, protected from the elements with its IP6X rating its not afraid to get wet or dirty. When you go out for a trip the weather never seems to be on your side, but this camping LED light has aprotection, meaning it's weatherproof.Made from a durable ABS plastic this LED light will last you ages and with its fantastic features you won't ever go camping without it. Heading off on ad adventure, well be sure to pack some good lighting. Being super small and not hard to carry, this tent lightwill not be difficult to transport asn it can easily slip in your pocket. With its hanging clip this mini camping light can clip to the top of your tent or attached to your car because with its built in magnet it won't slide all over the place, perfect for when your hands are occupied. Emitting 180 lumens of light this mini LED lamp has enough light for you to cook by or even read with and its 1800mAh battery brings hours of usage. This well designed, small camping light is a must have item for anyone who leave the house for next adventure into the wilderness. With 3 different modes of light including low, medium and flash you have options for every event. Its wasy to select the right one for your needs by simple pressing the button. Low light can be used as mood light during a romantic picnic and stronger lights will substitute a camp fire as you gather around to eat and chat in an evneing. If your phones dead don't worry as this LED lamp lets you put some extra charge in your phone with its 5 volt 1amp output so you have a vital backup power supply if you should ever need it. This LED camp light comes with a 12 months warranty, brought to you by the leader in electronic devices as well as wholesale LED lights.. Effective Area: Up to 15 Square Meters.